Ray Lutz at voter registration table registering someone with police looking on, just prior to his arrest at Civic Center Plaza, at approximately 1:30 pm, 11/29/11. Photo via facebook. After setting up a table at Civic Center Plaza this afternoon to do voter registration, an Occupy San Diego organizer was arrested by police for “trespass and refusing to leave”. 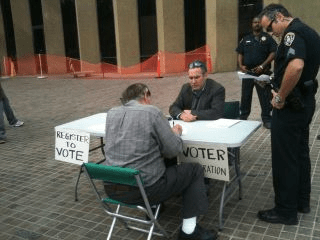 At approximately 1:30 pm, Ray Lutz was sitting at a table with several signs stating “Register to vote”, and was in the process of registering a man, when a half dozen police officers approached him – including Captain Mark Jones – . They hovered over the table, examining some of the documents next to Ray – who also had his laptop with him – and then proceeded to place him under arrest. Ray had set his table up on the north side of Freedom Plaza to do his voter registration. Lutz is a former President of the East County Democratic Club and former candidate for Congress and California State Assembly. He has been a visible organizer of the Occupy San Diego movement, having organized at least one event where a hundred protesters attended a City Council meeting. He certainly is known by the sergeant and police captain who participated in his arrest. Press Conference tonight: There will be a press conference at the Plaza tonight, Tuesday, at 7:30 pm. to air this issue. Just yesterday, Lutz had sent a letter to the owners and managers of the Civic Center Plaza Office Building that, in part, expresses concerns of the use of the area which is designated as private property around the building by the public for peaceful political activity. See the full text of Ray’s letter at Citizens’ Oversight Projects (COPs). Ironically, earlier this month at an “new immigrant” ceremony at the Community Concourse, there were two booths set up to register new voters. Each had a large tarp and table and set unmolested by the SDPD for hours. Crazy! Outrageous! Hey, guess what, folks, the SDPD has trumped our rights. And who sits at the top, none other than ex-police chief Mayor Sanders. Nice going, Jerry! No they didn’t. If the place he was at is private property and the owners of said property told him to leave, and he refused then he is trespassing. Would he like a GOP activist setting up a table on his front lawn (assuming he has one) and registering voters? The honest answer of course is no. One item my Democrat friends can’t seem to comprehend is: we are a society of law. Now, protest and demonstration is good and about as American as it gets, but we also need to be cognizant of each others civil rights. Hey Jon, I was surprised to see your name pop up here! I want to introduce you to my partner Frank and welcome you to the OB Rag. Hi Jon, welcome to the OB Rag – a creation of Patty’s – (so blame her). But listen in California at least a person soliciting signatures, handing out fliers, doing voter registration can go where the public is invited, even if on “private” property. So, for instance, someone like this Ray Lutz can go into a mall and legally solicit political views, donations, signatures. As the malls have taken over California and the country they’ve become the new “main streets” or main squares for cities and communities. So, municipalities cannot privatize space that is open to the public. So Lutz here is absolutely in his legal rights to do what he tried to do. You said ” One item my Democrat friends can’t seem to comprehend is: we are a society of law” So after I picked myself up off the floor, let me remind you who famously said “THE CONSTITUTION IS NOTHING BUT A GODDAM PIECE OF PAPER” Jon, that was George W Bush. The whole 8 years of George W Bush, a republican, was one long crime spree. Scores of his associates and friends and administration members went to jail or are still in jail. Of course the really big fish, like Paulson, Geithener, Summers, Cheney etc got a pass from Obama as they are in the same club. Hint: We are not in that club. Since voter registration has been done here often over the years without incident, one would think Ray’s intimate involvement with OSD might be a mitigating factor. I suspect Ray will not pay the fine and instead have his day on court. Go Ray. The deflateurs need to discover the bi-color cars transporting the brown shirts. Jerry Sanders – what a piece of work. Makes Frank Curran look like a boy scout. Even as Mayor he’s manage to be nothing more than a cement headed thug. Cement headed by the way is a law enforcement term for a dumb cop. But really, Sanders isn’t that dumb – but very dirty. And this unlawful – yes unlawful – check the ordinances – I’ll bet the city fails to cite an actual ordinance on the citation. Force the issue, demand professionalism from our sloppy cops. Yes, sloppy – take a look at the SDPD’s clearance rate compared to other agencies. Hey, look at the leadership. About as good as the Chargers. Perhaps this false arrest incident can build regional, statewide, and national support for a demand that the Obama administration launch an investigation into the evidence of a national conspiracy by munipal officials (and others) to violate the civil rights of thousands of peaceful protesters. Can we get Filner to call for it? The whole congressional progressive caucus? We need to start demanding that people like our mayor be arrested, and sent to prison. Demanding that such criminals only resign is not enough. I think we should bombard SDPD with phone calls everytime we see someone at a grocery store, mall or other places doing voter registration! (That is kind of in jest, but kind of not in jest.) This was was pure and simple based on who he is and what he is standing for. This selective harrassment makes mockery of what our peace officers are supposed to be doing which is looking out for the well-being of the people — not just some people, all the people. Ray’s letter was great and completely factual, and I think the powers-that-be made a tactical error in the actions of yesterday. It has only strengthened the resolve of many, many people who support the movement. I know it strengthened mine. Also, I hope you all signed the petition to oust Landsdowne, but I have to add that I think Jerry Sanders is actually the puppetmaster here. Enough rambling. Does anyone know whether I’m likely to be arrested if I set up to get signatures on my capital punishment abolishment initiative petition? I had thought to do that the next time I go down to Freedom Square (probably Saturday).